Happy Memorial Day for those of you in the USA. I am going to celebrate the day with a cookout at the beach with friends. What could be better than that? I was planning to make coleslaw as my contribution to the meal but someone beat me to the punch so I will be bringing dessert and gazpacho. Which is fine (really, it is fine). Except that I wanted to make my new version of coleslaw that has me very excited. One of the issues I have always had with coleslaw is that you have all of those healthy good-for-you vegetables like cabbage and carrots and onion, and then you drown them in mayonnaise and sugar. (Yes, I know there are other versions but this is the one I grew up with and the one I like, ok?) As I have moved away from processed foods and added sugars that has been problematic for me. I would make it and I would eat it, but I never really considered it a healthy vegetable dish and thought of it as more of a treat. The last few times that I made it I used homemade mayonnaise thinned with buttermilk and I added a handful of raisins instead of using sugar. I felt better about eating that, but I still did not feel that it was as healthy as it should be. And then I was listening to a series of interviews about food issues and someone mentioned cashew milk. And someone else mentioned the benefits of eating raw cabbage. [cue Melanie Griffith in Working Girl] and then I started thinking raw cabbage - cashew milk - raw cabbage - cashew milk and it just kind of came to me that I could maybe use a thicker cashew milk instead of mayonnaise in my coleslaw. 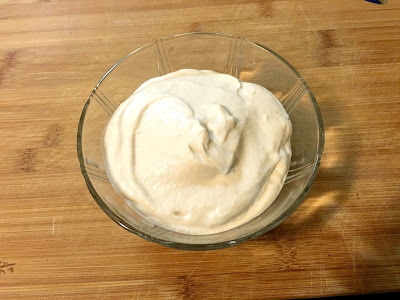 So I went online to see if it had been done before (of course it had) and I found lots of recipes for something called cashew mayonnaise that included all kinds of interesting ingredients. As usual I took what I liked from them and left out what did not seem a good fit to me and I made my first batch. Which was ok, but I had used cider apple vinegar and that overpowered everything far more than it does when I use it for my homemade mayonnaise. The second time I used lemon juice and I liked that much better. And as I thought, it makes a killer coleslaw that not only tastes great but is much more healthy than the mayonnaise version. And it is perfect for picnics and cookouts because you don't have to worry about it sitting out in the sun all day the way you would with the mayonnaise version. Win-win! 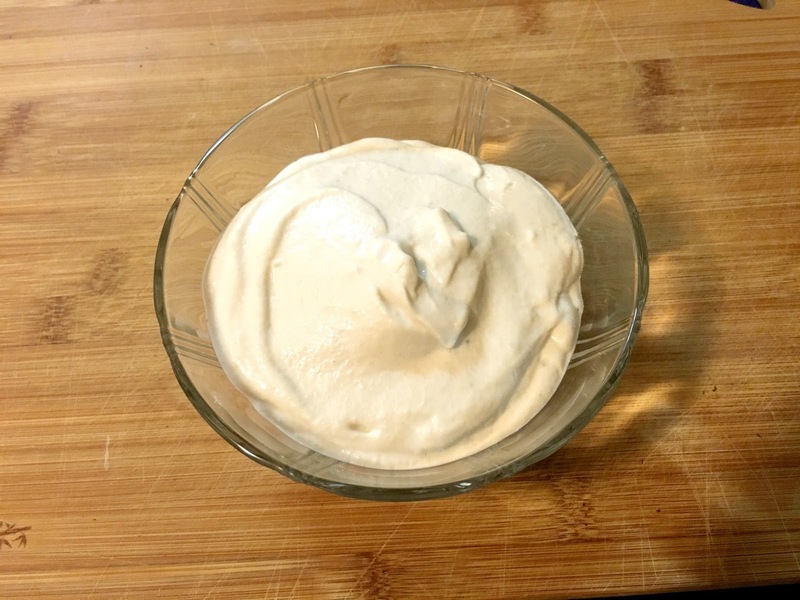 You will find that all of the versions of this recipe posted all over the internet call it "Cashew Mayonnaise." I refuse to call it that because the two have virtually nothing in common. Mayonnaise is the emulsion of egg yolks and oil. Cashew spread is basically pulverized cashews. Others may want to call it mayonnaise and that is certainly their right, but I just cannot bring myself to do it. This is not a substitute for mayonnaise. But it is delicious and versatile in its own right and I will be making it often. If you give it a try I suspect that you will be making it often, too. Drain the cashews and put them into a blender. Add the rest of the ingredients and blend together until smooth.